Stops are bolted through web of rail. Stops fold outward when not needed. 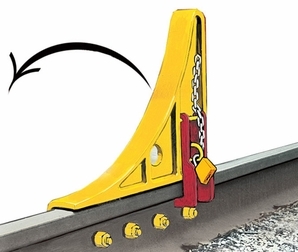 Lock casting grips head of rail and can be padlocked to prevent unauthorized use of stops. If load is too great, bolts can shear. Equipped with padlock for locking in upright or lowered positions. Car Stop folds away from rail to outside of track. For rail 85-141 lbs. Weight 94 lbs. 1-2 cars. Light-duty side track.